I love prompts where you have to do random stuff like this. Since I am the self-proclaimed “Blogger Without a Cause,” a rebel amongst the WordPress ranks, of course I could not just answer this prompt. That would be too easy. (Relevantly irrelevant movie quote trivia: “There’s a lotta things about me you don’t know anything about, Dottie. Things you wouldn’t understand. Things you couldn’t understand. Things you shouldn’t understand . . . I’m a loner, Dottie. A rebel.”) I had to live the prompt for a day and obsess over how to answer it. I read the Daily Prompt at work and had every intention of doing it exactly as the prompt directed. I had two books in my work bag, but I wasn’t thrilled with the page 82’s. Instead, I went home and grabbed the book that’s nearest to me . . . nearest to my heart that is. Hey, the prompt didn’t define “nearest” so I read it broadly. God Hates Us All, by Hank Moody. Bad Feminist, by Roxane Gay. The Notebook, by Nicholas Sparks. Apologies for the flash glaring out the picture of Gosling and McAdams swooning. Let’s start with God Hates Us All. Anyone watch Californication? Such a good show. One of my favorite parts of the show is the premise–Hank (David Duchovny) is a New York author who wrote this book, God Hates Us All, which gets turned into a movie called A Crazy Little Thing Called Love. Gotta love that. Hank has to relocate to California, and antics ensue. Someone, somewhere got the idea to have the fictional Hank Moody book published for real, and my friend Angela bought it for us. It’s kind of a neat fan thing. “What a prick,” he says, already removing the vaporizer from his sin cabinet. I haven’t gotten to this part of the book yet, so I’m wondering what a “sin cabinet” is and if I should get one. This seems like a typical line that you’d hear in Californication, which features a lot of fornicating and sinning, especially by Hank. 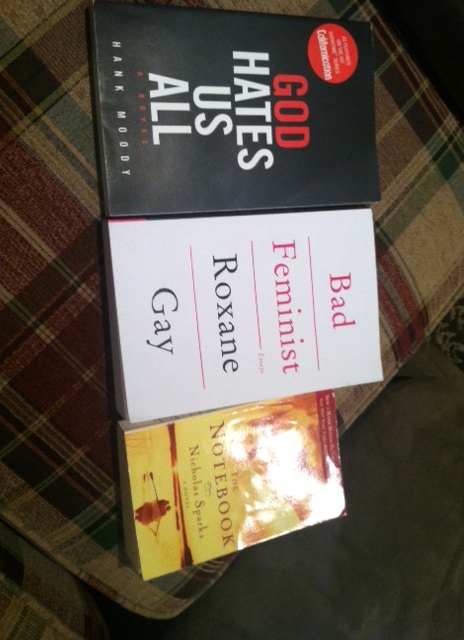 Onto Book Two: Bad Feminist, by Roxane Gay. I’ll start by acknowledging that it may seem that a book about feminism should not be anywhere within walking distance of anything Hank Moody. However, some may argue that Hank is actually a feminist. We will not be arguing that here. Whether or not Hank Moody is a feminist is for another post. I will take this opportunity to suggest that you read this book. It’s a collection of essays, resulting in a different way to read about feminism. There’s a lot of discussion about television, books, and pop culture, an essay about intense Scrabble competitions, and pieces about the author’s life growing up. It’s enlightening, insightful, sad in parts, funny in parts, and entertaining. Highly recommended. Onto the prompt, and page 82. We are not that green. Ugh. Not the best sentence to write a post about, and explaining what she’s discussing is too much for tonight. Let’s move on. Once he was married, he’d shorten his hours, he promised himself. Really? A LON thought? All those great lines between Allie and Noah, and page 82 is a LON line? Ugh. If you know The Notebook, you know that Allie has to choose whether to be with Noah or Lon. I think to 99.9% of the entire universe, that decision is a no-brainer. I have to say though, Lon isn’t terrible. He just isn’t Noah. As the line above demonstrates, Lon is a hard-working attorney. He’s handsome and the parents like him and he has money. He’s a catch. The Notebook is one of those books that stays with you. If you like sappy stuff, like I do, you can read it over and over, and then watch the movie a million times and still not get tired of it. You’ll also cry every time, even when you know the ending. I guess my attempt at the Daily Prompt turned into a mini-fangirl-book-tv-movie-review. That is the magic of the Daily Prompt. So if there’s anything worth taking away from this post, it’s this: If you haven’t read The Notebook you should be ashamed of yourself. Also, go read Bad Feminist and watch Californication. Maybe not on the same night, or your head will spin. Thanks for visiting and have a nice night. Love Californication. Will read Bad Feminist. You know how I feel about everything Sparks. I must have failed you in some way. But to each his own. Good post!